Read those statistics and let that sink in for a minute... 68% is HUGE! This means the majority of the time you are working with your customer the choice to stay with you or leave you is not because of your solution but your service. It is for this reason that you should focus on delighting and WOWing your customers with each and every engagement. The first step in WOWing your customers is assuring that you understand what it is that they are looking for. I've run across the image below a number of times and it often makes me laugh. 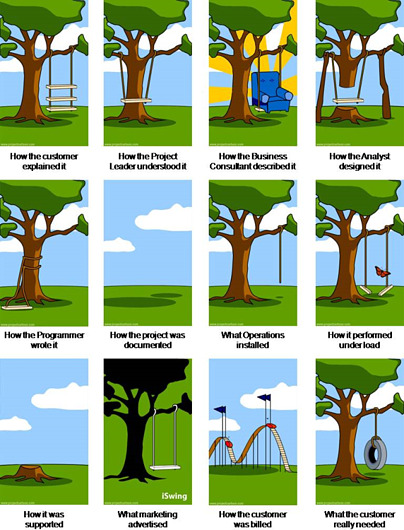 We have all been there, as I'm sure we've ALL had "those" projects at some point in our careers. However as funny as the cartoon is, the reality is in the message. If you don't fully understand what your customer is looking for, articulate that back to the customer, and assure you are on the same page with your project before you launch production, you are bound to present an experience that is both frustrating and challenging for both you and the customer.This holds true for all organizations, especially when you are providing a service such as marketing. It costs five to six times as much to get a new (first time) customer as it does to keep a current one. Source: the White House Office of Consumer Affairs, Washington, DC. Set expectations - the most important thing with any campaign you are running is to always set expectations. Review the SOW together, discuss what the project deliverables will be, and be sure that both you and the customer are on the same page with what the main milestones and deliverables will be. Be responsive - no one wants to be ignored. Be sure that if your customer sends you a question, request, or update that you always respond within 24 business hours. Even if you can't respond with an answer yet, let them know when you will send that answer so they feel heard. Under promise and over deliver - if you know you are going to be able to deliver something early to your client that is GREAT news, however always surprise them with early delivery vs try to scram to get something done and miss a deadline. Be sure you are clear with project timelines and then work to exceed them on the back end. Help your customer succeed - what will your customer see as a successful result to your project? Ask them this and then work with them to succeed as a business. Care for the customer - don't be robotic with your project. Everyone is human and we "like" working with people that we like. Learn about your customer, their family, their hobbies, etc. Care for the customer and they will care for you. Share the same end-goal - this goes hand in hand with helping your customer succeed. But share this goal together. If your customer succeeds, so do you. It really is that easy! Communicate if a deadline or milestone will be missed - this can happen in any project. The important thing is to call out when this is going to happen and let your client know that you are behind schedule. The worst thing you can do is avoid it and have the customer ask you for an update. Share thought leadership and training content - Is your customer interested in learning more about a specific area? What do you have at your disposal that you can share with your customer that will help them learn and improve as an individual? Re-set expectations - anytime your project goes off base or slightly changes always be sure to go back to the original expectation setting conversation. You should always be on the same page with your customer on your deliverables. Go the extra mile - Sending a hand written thank you note at the end of your project will be a minimal investment but go a long way for your customer experience. Use these simple tips and you will be well on your way to a WOW customer experience. Let us know if you have any additional tips you use to delighting your customers!